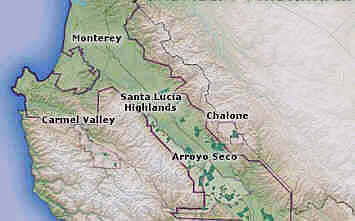 The Santa Lucia Highlands has become a highly-regarded viticultural area in recent California winemaking history. 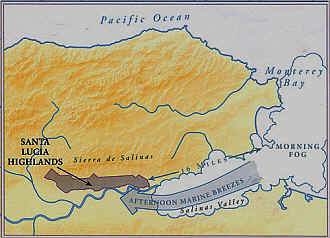 Led by the efforts of a grape grower and wine fanatic named Gary Pisoni, this region is located on the west side of the Salinas Valley between the town of Gonzales and the Arroyo Seco canyon. The vineyards are on southeastern-facing benches which catch the morning sun, should the fog lift that early. Vineyards such as Pisoni's are at about 1300 to 1400 feet in elevation, so they're above the fog, according to vineyard dude, Mark Pisoni (one of two of Gary Pisoni's kids). "Both 2000 and 2001 are really good vintages and they're pretty similar in terms of growing conditions." Mark Pisoni told us. "Bud break in 2000 was March 8th, while in 2001 it was March 14th. The grapes started to gain color (called "veraison") on July 4th in 2000, and on July 6th in 2001. We picked our first grapes on September 5th in 2000 and on September 2nd in 2001." The Pisoni family has a joint venture with their neighboring grower, Gary Franscioni. That's called "Garys' Vineyard" and is at a somewhat lower elevation than Pisoni's own property. As a result, the Garys' Vineyard is a cooler site according to Mark Pisoni. "It's often below the morning fog and usually is harvested a couple of weeks after our own vineyards. Further, Pisoni vineyards are on poorer soil; a lot of decomposed granite and it's a bit more rugged and mountainous. The Garys' Vineyard soils are a shade richer and slightly less rugged." Most of the vineyards in this neighborhood are not terribly old. Much of the Pisoni vineyard has been planted in the past 15 years. Garys' Vineyard, for example, was planted in 1995. The Franscioni's "Rosella's Vineyard" was initiated in 1996. If vine age means anything, the best is yet to come! We assembled a set of some of the top producers of Pinot Noirs from this region. The Pisonis charge Napa Cabernet prices and then some for the privilege of buying the fruit. Over the past few years, the Pisonis have even stopped selling fruit to some vintners. Others have decided vinifying the fruit is tricky, explaining "Pisoni vineyards fruit sometimes has had a tendency to not finish its fermentation routinely. I'm stressed out dealing with a stuck fermentation and how to get the wine dry. It's far more work." said one winemaker. Mark Pisoni explained "Our name is on their labels. We insist the vintners make good wines. We don't want our name associated with poor quality." One element in tasting these wines is "Are we looking for these wines to taste 'Burgundian' or is there a special character of terroir given to the wines by the Santa Lucia Highlands location?" One taster actually marked down a wine for being "too Burgundian and not tasting like a Santa Lucia-grown Pinot." We told Mark Pisoni of our evening's line-up. "Sounds like a great tasting!" he replied. Two wines were a bit ahead of the pack, but with a low degree of unanimity, having a rather "high" score (total points). Third place through 7th place were separated by just 2 points, meaning there was no significant difference in third place through seventh! And the last place wine was only 12 points out of 3rd place!!! Notes compiled by Gerald Weisl, with Bob Gorman adding his two-cents' worth (when he gets around to it). 8th Place: MORGAN 2000 "Garys' Vineyard"
This was the lone entry from the 2000 vintage and it had 4 tasters rating it highly and 5 people disliking it. One taster described it as having "earthy notes and a rhubarb character." A couple of other people felt it was "really hot" and "high in alcohol and not showing much fruit." A fourth critic found it "Burgundy-like with a bit of H2S, it's light in color and has some funky, Burgundian notes...weird." A fifth critic found it to offer a "strange after-taste." Someone else described it as having "the most Burgundian nose, herbaceous, smoky, with good acidity, nice oak and nice fruit." Gerald found this to be a nicely Burgundian-styled rendition. "Lots of sweet, sweet fruit notes and a bit of a vegetal tone. There's a vague hint of a mushroomy quality on the nose and some nice vanillin tones from the wood. The wine displays a lovely cherry fruit flavor of Pinot Noir and nice oak. Not a wine for cellaring, but very pretty right now. One-and-a-half stars on my three star scale, no stars being a standard or ordinary quality wine." 7th Place: SIDURI 2001 "Pisoni"
One taster felt this was, like a number of these wines, "a little bit sweet, almost cloying sweet. I couldn't stand the sugary character. It does offer some spice and dark cherry fruit...a hot wine." Another taster pegged this a being reminiscent of "cherry cough syrup. It also has a resiny, menthol-like character. Not very pleasing, though I moved it up in my rankings." Someone else found this wine to blossom with aeration, saying "It grew in the glass." But another person felt it "was stilled closed in." One panel member said this "has more opulent flavors than the others, with blackberry and tangerine-like flavors." 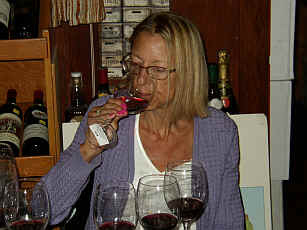 Gerald said the "nose on this starts out rather shyly, but you get a sense of some nice fruit. It reveals a bit of vanillin, too, being moderately Burgundian in style. The wine is a bit tannic, though, having nice vanillin notes and some woodsy, charry flavors. One star now...perhaps this will blossom with a year in the bottle and warrant a higher rating." 6th Place: OJAI VINEYARD 2001 "Pisoni"
This was the darkest colored wine, appearing more like a Zinfandel than Pinot Noir. One taster felt it had a "yeasty note on the nose and also on the palate. It's less fruit-driven than some of the other wines and is somewhat understated." Another critic agreed, finding this to be "muted on the nose, but big, over-extracted, hot and hard to swallow. It does open up a bit, showing some spicy tobacco notes and an earthy, dusty quality." A third panel member described this as being "more like a barrel sample than a finished wine! It's overly extracted, too!" Another critic encountered "an okay nose and woody flavored wine with a big, full mouth-feel." 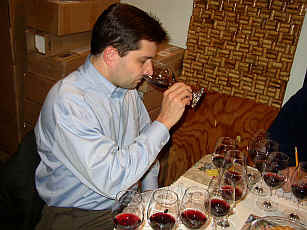 Gerald ranked it down, not for being of poor quality, but for not being very reminiscent of Pinot Noir. "The color is more deep and ruby-like. On the nose there's a big, berryish, almost briary quality which reminds me of a ripe Zinfandel. It is impossible to take a sniff and find anything Burgundian or Pinot-like on the nose. On the palate it's a monster! Big, ripe, plummy fruit notes with a fair bit of alcohol providing heat. I would never imagine this to be a Pinot Noir." 5th Place: ROAR 2001 "Pisoni"
Here's a wine that had 5 people ranking it highly and 5 people hating it. One taster described this as "Zinfandel with volatile acidity." Another naysayer found "SO2 on the nose and it was sort of spritzy. Something is off here." One panel member found it to display "chocolate, coffee and cherry notes but it lacks finesse. It's also a little light." A fourth person characterized this as "a guilty pleasure." A fifth person found it "pleasant, but not very exciting." Someone encountered "jammy fruit," saying "I can see why people would like this." A final voice said this has "especially supple tannins and great spice with notes of morello cherries and loganberry." Gerald was put off by the "almost nutty notes reminiscent of an old wood-Port. The aromas offer hints of the rancio "nuttiness" one finds in old Sherry or some tawny Ports. It also hints at being sweet, so perhaps this wine was subjected to being coaxed through a 'stuck fermentation.' It shows a fair bit of alcohol and tastes more like a dry Port-styled wine than anything to do with Burgundy. It is most strange!" 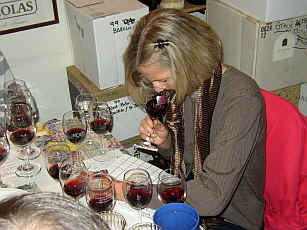 4th Place: PATZ & HALL 2001 "Pisoni"
One taster found notes reminiscent of "tomatoes!" in this wine. Another person found "good balance and it's very smooth and rich." But a third person described it as being "a dessert wine!" 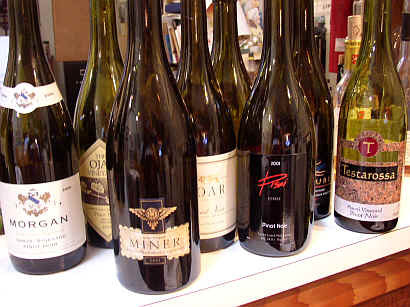 A fourth agreed, saying it's a "late harvest Pinot Noir dessert wine." Someone else felt this "had the best nose. Cinnamon and dark cherry fruit are displayed here." Another taster said "the fruit is very sweet here." Sounding a less positive note, someone said "It's got some SO2 and mercaptan on its aroma and palate." Someone else encountered "red and black raspberry fruit but it's too sweet." 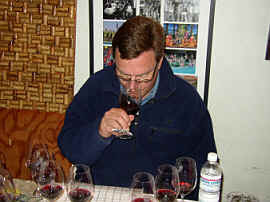 Gerald found the nose to be "berryish with lots of sweet cherry notes...very stylish and pretty aromas. It's off dry, though, having a bit of residual sweetness. The combination of residual sugar and alcohol makes for a curious combination: the alcohol gives a hot, harsh note while the sugar placates some of the heat from that alcohol. It might warrant a one star rating if you can get by the sugar. Perhaps serving it with something like duck with a sweet cherry or orange sauce will take the edge off this wine?" 3rd Place: PISONI ESTATE 2001 "Pisoni"
One taster felt this "is not very Pinot Noir-like. Blueberry fruit notes here." Someone else described it as having "an oily texture." A third critic found a "bunch of berries, bramble and it's elegant." Someone else said it's "not classic Pinot Noir, but does have some vanilla, raspberry fruit and it's rather monolithic. Tasty." Another panel member found notes reminiscent of "rhubarb." Someone else said it's ""got nice fruit, a bit lighter with cherry notes, red raspberries and nice acidity." A final voice said it displays "rich, cherry fruit and is a bit tart on the finish." Gerald found the fragrance of this to be "very sweet...hints of cherries and cherry cola with some toasty qualities and a woodsy note on the nose. It has a slight sweet point on the palate being rather robust and rich. Big fruit on the palate followed by a lot of heat and a burning sensation thanks to the alcohol. Might be worth a one star rating." 2nd Place: TESTAROSSA 2001 "Pisoni"
Virtually tied for first place, being a mere one point behind the top wine, this was characterized as "over oaked" by one critic. Another found the aromas reminiscent of "auto exhaust fumes." A third taster felt it's "flat on the palate." Another taster detected "cotton candy, sweet cherry notes with some pomegranate and pineapple mint...some cherry Coke flavors and gritty tannins on the finish." Someone else found "a multi-dimensional nose with nice blackberry fruit." Another taster found this to show "young, cherry notes and it has good fruit on the palate with a long finish." Gerald described this as being "somewhat along the lines of a good Burgundy/ Nice Pinot fruit with cherry and vanilla fragrances. There's nice body and richness here and I felt it didn't show the heat of some other wines. One star." 1st Place: MINER 2001 "Garys' Vineyard"
"This really grew in the glass." said one critic. 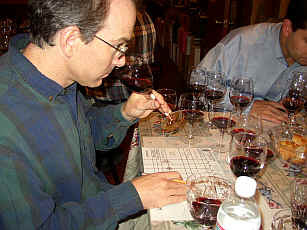 Another detected some "barnyard notes, being rich and the most interesting wine of the tasting." Someone else found "big, minty notes...it's very much a good Pinot Noir with phenolic, cherry and spice notes. It's a sweetie pie of a wine!" Another person said "It's too Burgundian and not enough showing Santa Lucia Highlands character!" Someone else felt the "acidity is a bit strong at first, but it mellows with aeration." Another critic found "dusty notes with burnt sugar fragrances and a lilac perfume. Nice weight, smoky, sweet fruit, a buttery, oaky quality." Someone else "liked the fruit. It almost has enough stuffing." A final panel member found this as being "softer with rose petal fruit notes." Gerald found "nice, bright fruit. Sweet aromas are very pretty and remind me a bit of a Chambolle-Musigny or Morey-Saint-Denis on the nose. Lovely. The flavors display sweet vanillin qualities, sort of in the direction of Burgundy. Pretty wine. One-and-a-half to two stars."